“Heigh-ho, heigh-ho, it’s off to the garden we go,” said kindergarten teacher Julie Dalton, wearing a sun hat, hip sack and green canvas bag. 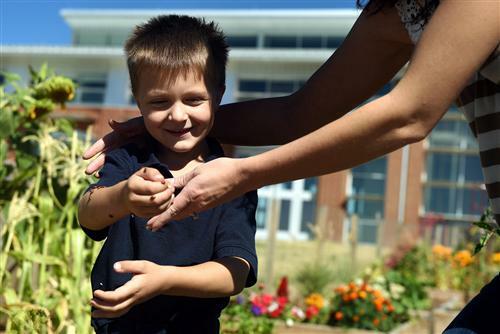 During a warm, clear afternoon Sept. 17 outside Imagine Classical Academy Indigo Ranch in Colorado Springs, Dalton led her singing students, each grasping onto a rope or an adjacent classmate, toward a community garden full of life. The garden is collocated with a fire station across from the school. Fire Station 21 opened in August 2013 to assist the city’s expanding northeast neighborhoods. Allocating land for the garden was included in the voter-approved bond for the station, according to Larry Stebbins of Pikes Peak Urban Gardens. Stebbins, PPUG director, encourages community gardens throughout the Pikes Peak region. In 2007, he founded the nonprofit organization to help get more started. After coordinating an application process, establishing rules and guidelines, publicizing and filling beds, the gardens are often turned over to local community groups. PPUG manages each bed at a cost of $50 per year. Stebbins says gardeners are often able to grow more than 70 pounds of produce in a bed every year, which offsets that cost. At the end of last school year, the students started filling their 21 beds, each 4-feet by 8-feet. Imagine Classical Academy Indigo Ranch, a kindergarten-eighth grade charter school in District 49, plants one-third of the Station 21 community garden. It opened in April 2015, with the help of nearly 100 school and community volunteers, including those affiliated with Boy Scouts, Girl Scouts, University of Colorado and Colorado College. The Station 21 garden is one of six currently managed by PPUG. Aside from combatting childhood obesity, Stebbins, a lifelong gardner and retired educator, says children who participate in a community garden will develop life skills and find tranquility. While coordinating with fifth-grade teacher Libby Moody, Stebbins donated plants and seeds to the school, as well as provided instructional support, including booklets and videos. The fire station provides the students hoses and water. 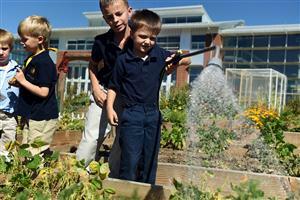 “It’s pretty cool that we have this to just relax,” said fifth-grader Jordan Hockett, who joined Dalton’s kindergartners, and helped them water the beds and pick carrots. Jordan, 10, was part of a handful of students who worked in the garden through the summer, ensuring it stayed watered, weeded, fertilized, pollinated and protected from the summer hail storms. The school’s students planted carrots, zucchinis, squashes, pumpkins, watermelons, onions, beans, peas, potatoes, tomatoes, parsley, basil and mint. They learned how sunflowers assist vine-type plants and marigolds deter destructive insects. While helping kindergartners pick carrots, Jordan observed how one patch was yielding a greater amount of a purple variant, while the rest were mostly orange. He wondered if the seeds weren’t mixed well, or if something else had happened. Dalton helped her students understand the plants, including their characteristics, their companion plants and their beneficial bugs. 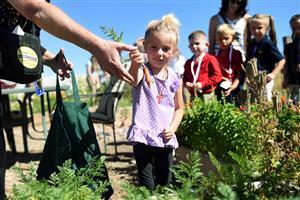 Area farmer Jamie LeVake brought two bags of ladybugs, which the children placed in their gardens. “They feel ticklish,” said LeVake’s 5-year-old son, kindergartner Collin LeVake, after brushing off an armful. Dalton, who emphasizes the core knowledge sequence in her classroom, says hands-on activities keep her kindergartners motivated to explore concepts. After returning to their classroom, she asked them to share their experiences using their five senses. “Our garden is a wonderful way to introduce children to the food cycle, from seeding to germination to blossoming. And we’re building a foundation for future lessons in plants and farming.